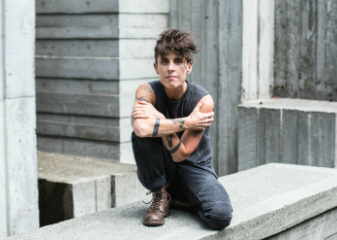 Winner of the first ever Women of the World Poetry Slam in 2008, Andrea Gibson remains one of the most captivating performers in the spoken word poetry scene today. In a fierce oscillation between activism and love, Andrea Gibson's newest literary triumph, Lord of the Butterflies is an artful and nuanced look at gender, romance, loss, and family, this is also a show of protest. While rioting against gun violence, homophobia, and white supremacy, Gibson celebrates gender expansion, queer love, and the will to stay alive. "Spoken word artists who have influenced me a great deal are Sonya Renee, Rachel McKibbens, Derrick Brown, Anis Mojgani, Patricia Smith … that list is so long I could keep writing names for the next hour. "The first poet whose work I truly fell in love with was Mary Oliver, and her books are still the place I find the most comfort in." Gibson grew up in Calais, Maine. Growing up in a Baptist home and attending local schools, she later moved in with a girlfriend, then lived for a time in New Orleans, and later the two moved in 1999 to Boulder, Colorado, where they settled. They went to their first open-mic in Denver, where Gibson was inspired to become a spoken word artist. Gibson also goes by Andrew and uses gender-neutral pronouns. Many poems are about gender identity, such as Swing Set and Andrew. "I don't necessarily identify within a gender binary. I've never in my life really felt like a woman and I've certainly never felt like a man. "I look at gender on a spectrum and I feel somewhere on that spectrum that's not landing on either side of that."